My 10-year-old daughter was about to step off the edge of a sheer cliff, with nothing but 100 feet of air between her and the bottom of a canyon, deep in Mexico’s Sierra Madres. What, I asked myself, was I thinking? If her hook didn’t hold, or if the zip line collapsed, she would be toast. For several gut-wrenching moments I seriously questioned my quality as a mother. Questioning myself was something I had frequently done over the course of the preceding five months. Every time I told someone that my husband and I were taking our kids to Mexico, I was forced to question myself because everyone was questioning me. Were we sure this was a good idea? Had we not been paying attention to the news? The tribulations suffered in recent years by our nation’s southern neighbor are sobering, to be sure. One of the many casualties has been our own perception of Mexico as a destination. 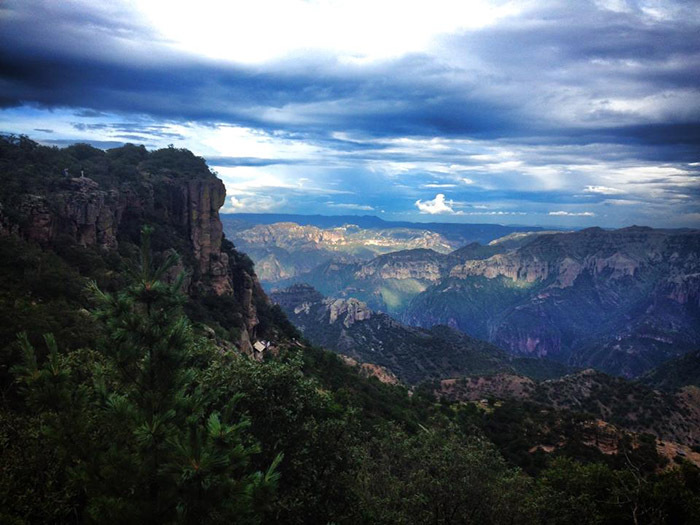 It’s a casualty that doesn’t only rob Mexicans of the tourism revenue; it robs us of rich experiences that Mexico has to offer, not the least of which are Las Barrancas del Cobre, known to us as the Copper Canyon. 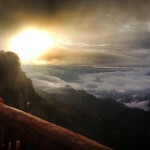 Breathtaking and imposing, longer and deeper and greener than the Grand Canyon of the American Southwest, the Copper Canyon is the Mexican destination opposite the beaches – both directionally and experientially. It’s where paved roads are scarce and cell coverage is even scarcer; it’s where modern civilization and native cultures still collide; it’s where over 60 species of oak trees can be found and it’s where the reverberations of the Mexican Revolution are still being heard. And it’s an ideal destination for a family adventure. 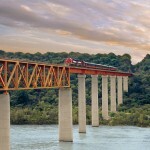 El Ferrocarril Chihuahua Pacifico (“El Chepe”) is one of the most dramatic train routes in the world. 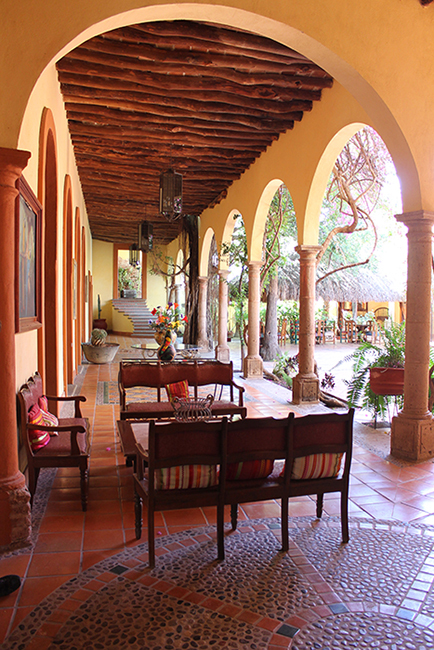 Hotel Posada Hidalgo in the small town of El Fuerte is recognized as one of the most beautiful hotels in Mexico. Canyon residents come out to wave to the train and its passengers as it passes through. The village of Cerocahui, deep in the canyons, was established in the 16th century, centered around this mission. A Tarahumara man guides us from the village to a nearby waterfall. Mexico’s Copper Canyon system is deeper and longer than Arizona’s Grand Canyon. The Tarahumara natives still live in the canyons much the same way they lived 400 years ago. 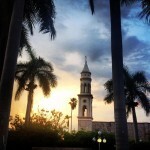 In the background: Hotel Mirador. 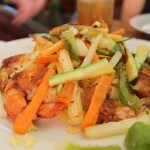 Balderrama hotels are known for their gourmet cuisine, even in the remote reaches of the canyons. In the 90’s my parents took my then-teenaged brother to Mexico, guided by Copper Canyon specialist (and my uncle’s wife) Sue Stilwell of S&S Tours. Sue is a blue-eyed blondie who speaks wonderful Spanish and champions the heart of the Mexican people whenever you give her your ear. My parents didn’t stop talking about the experience for years. Two decades later my husband and I have teenagers of our own, and we want what I expect most parents want from travel experiences: eye-opening, enriching, memorable fun. 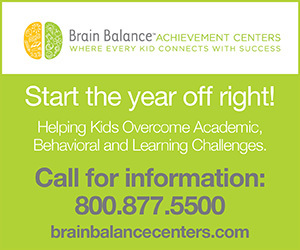 Safety is assumed… unless you start thinking about going to Mexico with your children in 2013. When we considered a family trip to the Copper Canyon we turned to Sue, who for decades (including recent years) has been guiding small groups into the heart of the region – not by foot, but by rail. That’s how most people, and all tourists, get there. 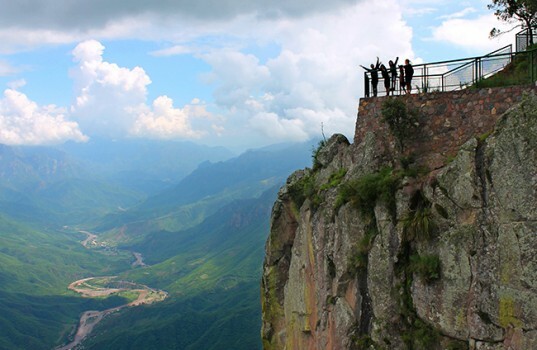 Railroad aficionados from all over the world come to ride the train into the Copper Canyons. 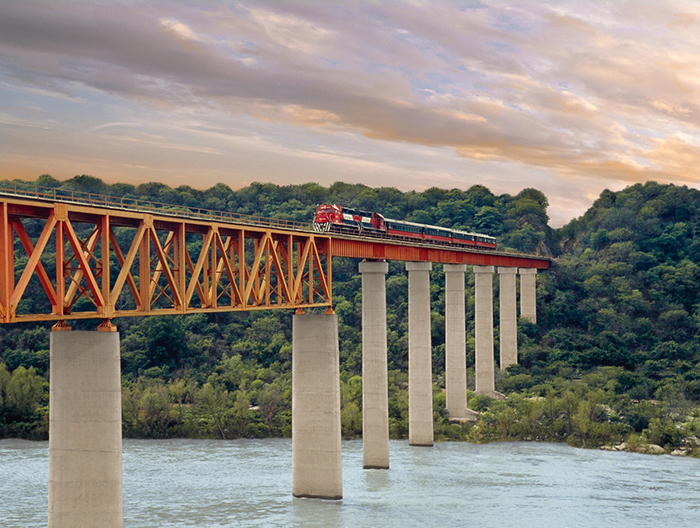 90 years and $90 million in the making, with 408 miles of track, 86 tunnels and 37 bridges, El Ferrocarril Chihuahua Pacifico (“El Chepe”) is an engineering marvel and one of the most spectacular train rides on the planet. At one point the train makes a 180-degree turn inside a mountain; at another, it loops over itself. It passes waterfalls, hugs mountainsides and flies over rivers and gorges. The platforms between cars are secure, yet wide open, letting passengers lean out from waist up to get unfettered views of stunning landscapes. It was near the completion of El Chepe in the 1960’s when lawyer Roberto Balderrama decided he would rather pioneer the hospitality industry in the Canyons than practice law. Today, under the management of his youngest son Bernardo, there is no better way for Americans – especially those with children – to tour the Copper Canyon system than with the Balderrama family of hotels. 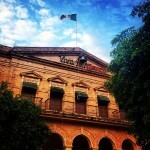 An eleven-hour bus ride from the border city of Nogales found us in Los Mochis, a big city on the Sea of Cortez that is home to Hotel Santa Anita, known for its incredible cuisine (as are all the Balderrama hotels). From Los Mochis into the Copper Canyons and back again we were in the hands of Sue and the Balderrama family, who curated our experience without overwhelming us. 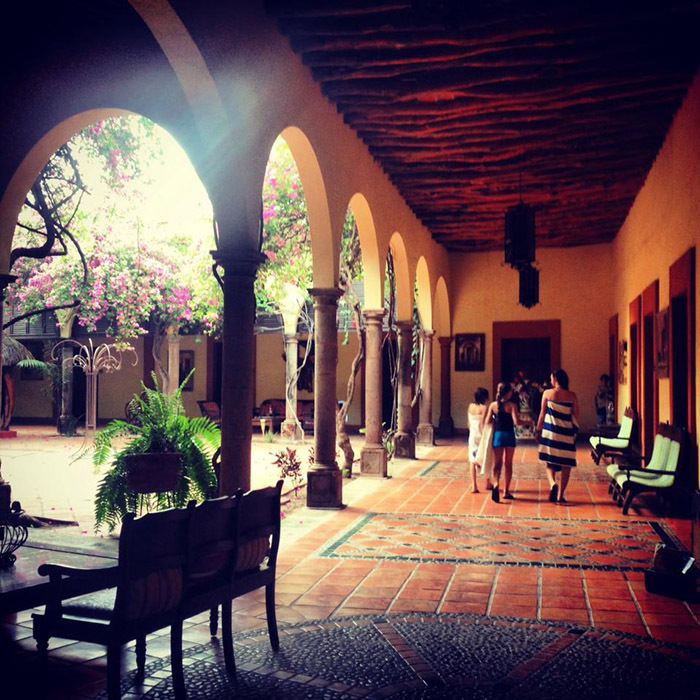 An hour inland from Los Mochis is the colonial town of El Fuerte, which is known as the “gateway” to the Copper Canyon and is home to the Balderrama Hotel Posada del Hidalgo. With tall arches giving entrance to deep porticos, heavy ten-foot doors, and fountained courtyards permeated by tropical warmth, the Hidalgo is a perfect confluence of Mexico’s colonial past and colorful present; at once elegant and welcoming, and utterly beautiful. A storied history makes the Hidalgo a destination in itself. One portion of the hotel was originally the private residence of the de la Vega family. It is said that Diego de la Vega, the man believed to be behind the legend of Zorro, as a boy inhabited the southerwestern-most room. Proper homage is paid to El Zorro at the Hildalgo. In fact, he shows up at happy hour to brandish his sword, dance with the ladies and delight the children. All six rivers that form the Copper Canyon system run into the El Fuerte River and out to the Sea of Cortez. From Hotel Posada del Hidalgo, Balderrama guides take their guests on an El Fuerte river float to spot rare birds, or on a riverside walk to discover Cahaita Indian petroglyphs that are thousands of years old. From El Fuerte, a few hours on El Chepe took us deep into the Copper Canyons, going from sea level to 5,000 feet in a morning, past some of the most stunning sights that Mexico has to offer. At the small town at Bahuichivo a Balderrama bus awaited to take us to the tiny village of Cerocahui, 45 mountainous minutes away, with nothing in between. Descending into the Cerocahui valley is a revelation – “picturesque” doesn’t touch it. Soaring peaks on every side, Cerocahui is home to perhaps 500 people and is centered around a small 16th century cathedral, a catholic boarding school serving Tarahumara girls from around the canyon system, and the small Balderrama Hotel Misión. 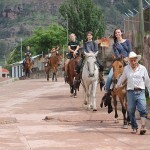 Donkeys, cows, even horses freely roam the little cobbled streets and rambling fields. In the summer monsoon season, the sun beats brightly in the morning before afternoon storm clouds roll in to obscure the highest peaks in mystery. There is no internet accessibility or cell service this far into the canyons (a remarkable benefit for the digitally overwhelmed). 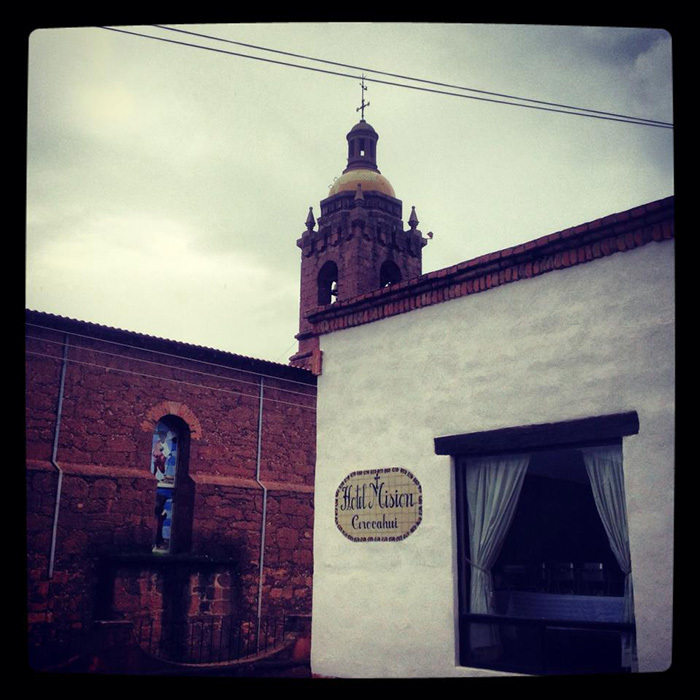 In Cerocahui there isn’t even anywhere for a visitor to eat besides Hotel Misión, which makes it a good thing that the Balderramas’ most talented chef makes it his home. Fig, apple and quince trees grow throughout the grounds at Hotel Misión, while across the little river that cuts through the village, grapevines producing for chardonnay and merlot are cultivated under the diligent tending of Balderrama caretakers. The small Misión vineyard is the highest in North America. In the last few years visitors have begun to flock to Cerocahui for the small harvest festival formed by Mr. Balderrama, where guests get to crush grapes and enjoy their fill of wine. 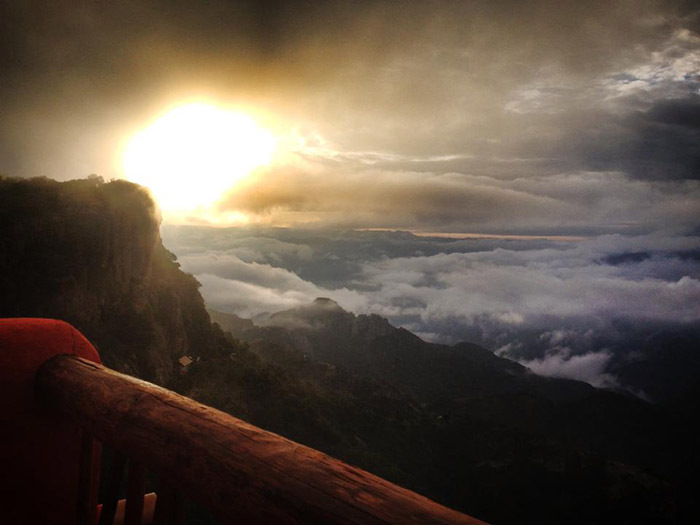 From Hotel Mirador, small Tarahumara “ranches,” nestled into the cliffside, are visible below. At the gate of a Tarahumara “ranch” we wait to be invited in, per the custom. 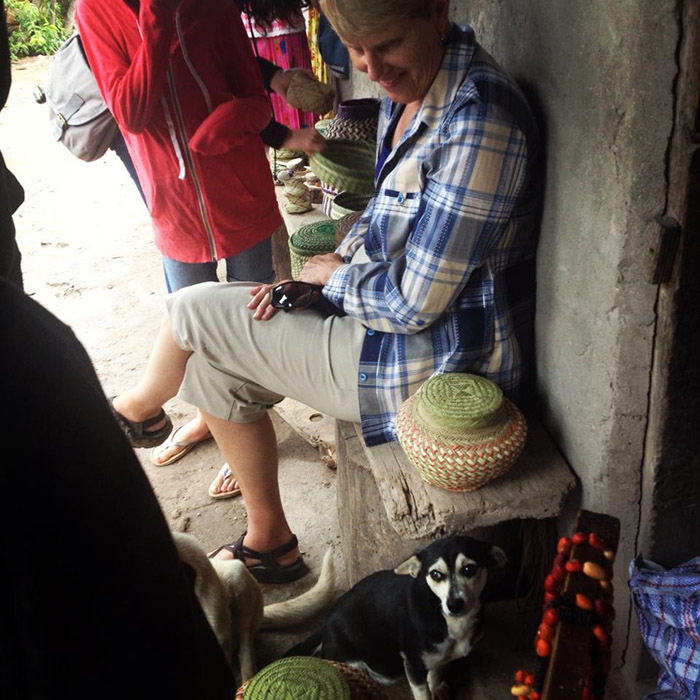 Our visit with the reclusive Tarahumaras saw us taking home several expertly woven baskets. 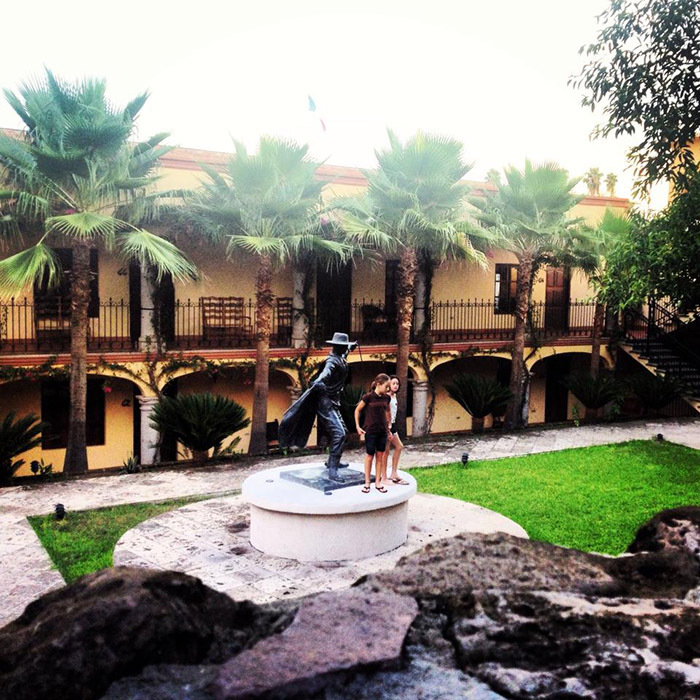 A statue pays homage to Zorro, the legend of which is said to have its home at the mansion that eventually become Hotel Posada Hidalgo. 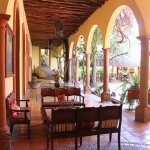 Hotel Posada Hidalgo is tropically warm during the monsoon season. Every room at Hotel Mirador has an expansive view of the canyons. 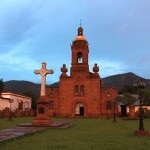 The colonial courthouse in El Fuerte. 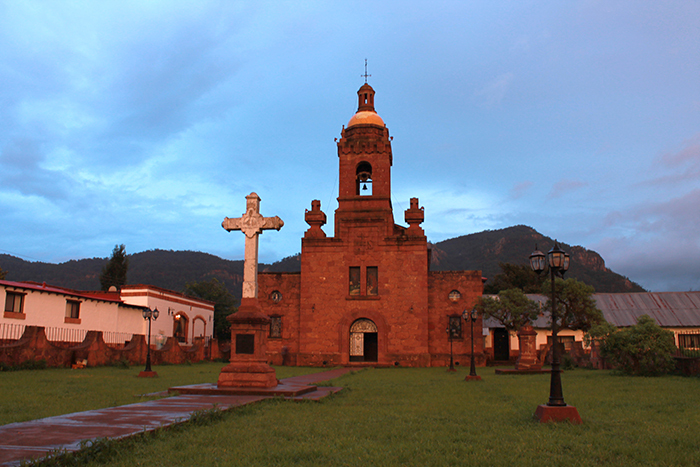 The colonial town of El Fuerte is often referred to as the gateway to the Copper Canyon. 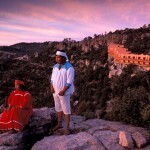 This deep in the canyon, contact with the Tarahumara Indians is common. Tarahumara comes from the native word Raramuri, which means “foot runner.” About 70,000 of these most primitive North American Indians live throughout the Copper Canyon system. The rugged, isolated terrain has offered the peaceable Tarahumara retreat from modern culture, away from which they have been running – literally – for centuries. 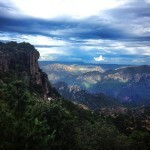 Of course, the Tarahumara know the canyons better than anyone. 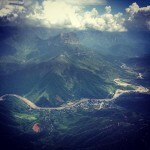 My uncle tells of a short day hike he took away from the village into the canyons. Though he is an experienced hiker, the canyons are known to be as changeful as they are beautiful and many a hiker has lost his way. My uncle got caught at sunset, slightly lost. He had been standing at a divergence in the trail for several minutes, quickly losing light and debating the path he should choose, when he looked up to see a Tarahumara man sitting quietly on a boulder above him, watching. When my uncle asked in Spanish the way to the village, the man simply pointed the way. Interaction with the Tarahumara is a privilege. They are shy and quiet, (even with each other) and they tend to live in very independent family groups, coming together as a community only a couple of times a year. Those who live close to the “mestizo” villages such as Cerocahui sometimes come to town to sell their pine-woven baskets, beaded jewelry and wooden carvings. Some make money as guides to visitors like us. We wanted to see the Cerocahui waterfall (a magnificent five-mile roundtrip hike from the village), and it was a 75-year-old Tarahumara man who led us nimbly through the river and into the forest to gift us an experience that we’ll never forget. Sue Stilwell, who has been frequenting Cerocahui for years, has developed relationships with nearby Tarahumara. 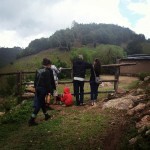 She took us to meet a sweet family at their small “ranch” on a steep hillside. At the edge of their property we waited to be invited in, per the Tarahumara custom. While we visited, small Tarahumara children peeked shyly around corners of stone doorways, apparently as bemused by us as we by them. Not far from Cerocahui is the most expansive view of the entire canyon system. Standing on the rim and looking right, the river carves its way west and the view is unobstructed for miles; looking left, the eastern canyons go on endlessly; looking down… well, you wouldn’t want to look down. Cerocahui is difficult to leave. 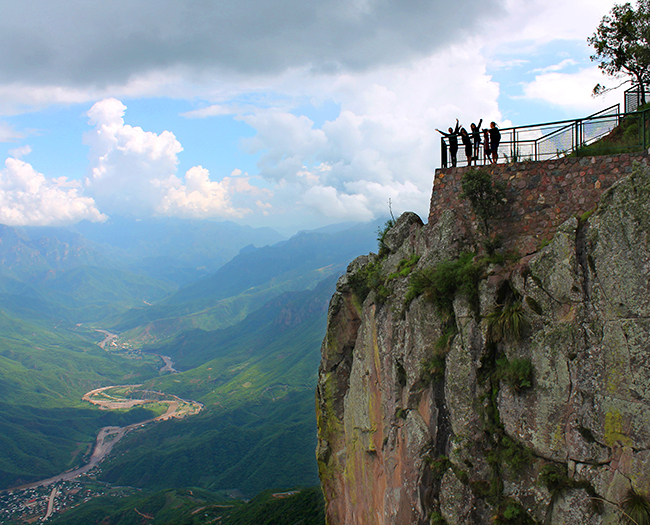 It’s so idyllic, you wonder what better experiences could await you, gringo that you are, in the Copper Canyon. However, where Cerocahui offers pristine tranquility, the higher altitude region of Divisadero offers a thrill – not the kind where a family gets lost on a hike and must be (luckily) saved by a well-oriented Tarahumara, but the kind engineered by mechanics and marketed by professionals. A few years ago the state of Chihuahua installed an adventure park near Divisadero, taking advantage of the region’s natural valleys and plateaus to create the third-longest zip line course in the world. In the coming months a line will be added that will be the single longest zip line in the world. Families couldn’t ask for a more exhilarating way to experience the Copper Canyon than to soar over it, a fact to which my 10-year-old can attest (her zip line held after all). Overlooking the entire scene is the Hotel Mirador, the most dramatically located hotel in the entire canyon system and the Balderrama’s flagship property. Perched on a canyon rim, Hotel Mirador was designed to furnish every room an unobstructed view of the canyons. Facing south, our balcony (and every balcony) provided a breathtaking view of both sunrise and sunset. 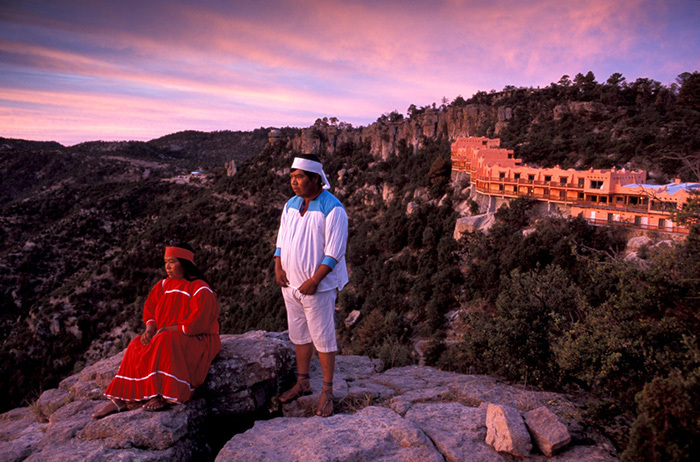 Innumerable hiking and mountain biking trails surround the hotel, while Tarahumara women and girls sit on its steps, quietly weaving baskets to sell to tourists who have sought out the Mirador as the most desirable hotel in the region. 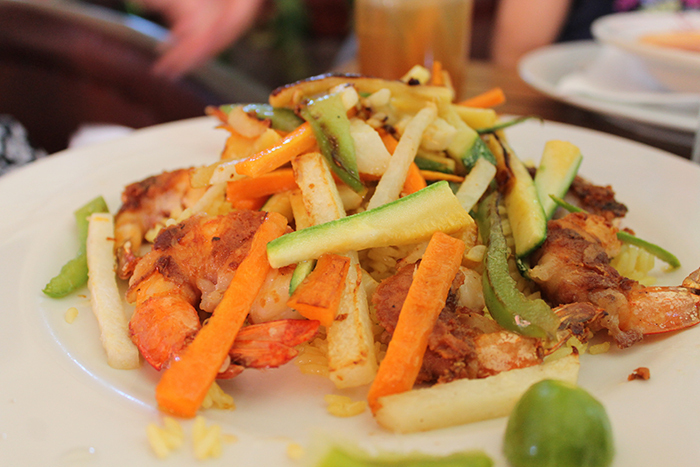 There are many things to see in Mexico, and there are many ways to see them. 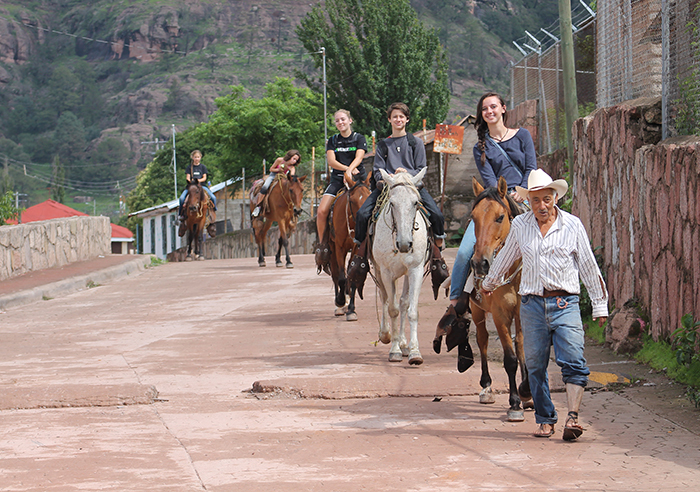 In the remote canyons of the Sierra Madre, particularly in the care of the Balderramas, families get that rare combination of true adventure and real comfort. It’s where children and parents can have an authentic experience with natural wonders and local people, but still get to eat and sleep like kings as they make memories that will last a lifetime. 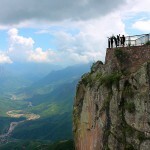 To learn more about learning adventures to Mexico’s Copper Canyon, connect with Sue Stilwell of S&S Tours by visiting ss-tours.com or call 866-780-2813. To find out more about the Balderrama family of hotels, visit hotelesbalderrama.com.